Clean Up Your Mailing List AND Your Office | Data Works International Inc.
Look around your office right now. Do you see a box or tub overflowing with returned mail? If so, don’t despair, rejoice! You are looking at a great opportunity to clean up your mailing list. 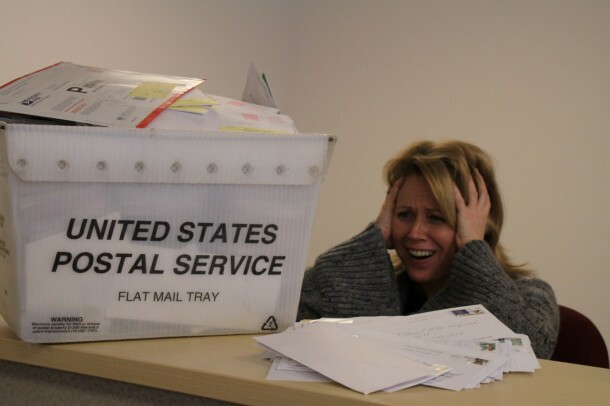 Postal rates will increase again in April 2011. Using current, correct mailing addresses will save you money on postage. And a good clean mailing list helps your message to reach more of your intended audience without delay. Therefore, updating your addresses from returned mail is a key component of any good database hygiene program. Even if your staff has the time to do address cleanup, they may not know the proper formatting conventions, abbreviations or punctuation rules for addresses, so your mail could be delayed or even returned again. DataWorks’ staff is trained in address correction and we adhere to USPS guidelines for address standardization. We can update your mailing list as a one-time project and send the clean list back to you, or we can maintain your mailing list and provide the data to you as needed. Resolve to start 2011 with a clean office and a clean mailing list! DataWorks is dedicated to helping companies in the Lehigh Valley of eastern PA, and beyond, get the most for their mailing and fulfillment dollars. Please contact DataWorks mailing services for more information.